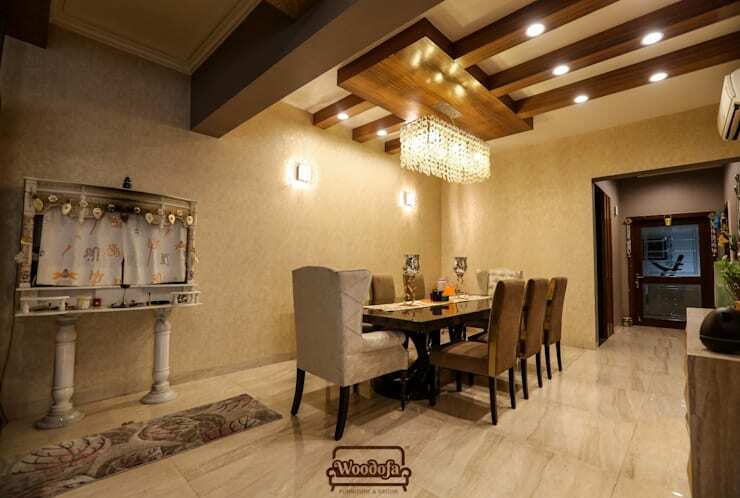 This Gurgaon Project by Woodofa Lifestyle Pvt. Ltd., is a one of a kind project. 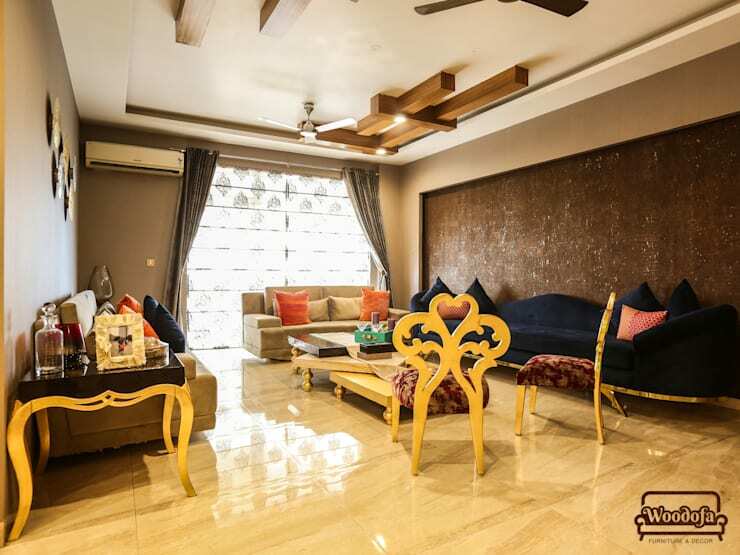 These Interior Designers & Decorators in Noida have done a fabulous job in creating a home that is opulent, comfortable and warm. The house has been designed from scratch to create unique designs, while also being completely functional. No corner of this house is ignored and no space in the house goes unutilised in this design. So let’s take a tour. The mediterranean living room is decorated with elegant furniture that has a unique design. The furniture uses a little bit of gold on wood to create an opulent effect. We can see the frame of the elegant royal blue sofa, the red upholstered chairs and the side table are all given a different design. The details in the design are what make it so unique. 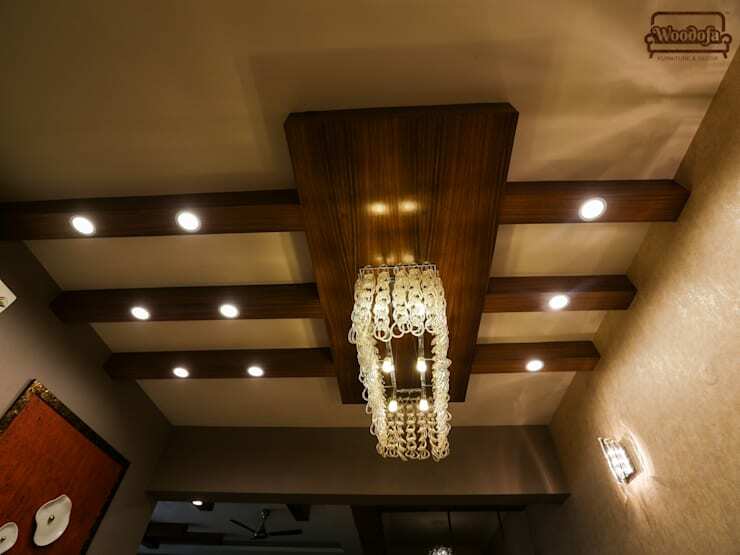 Here, we have a ceiling in the house that has been designed using wooden beams. 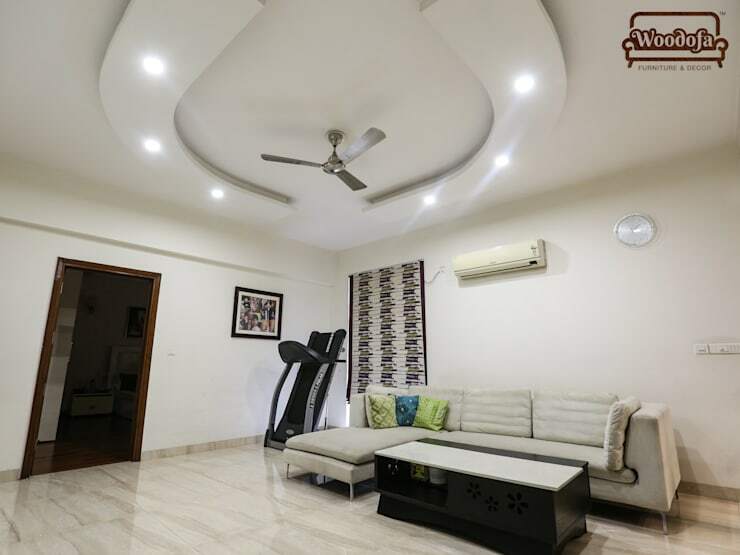 The criss-cross design was conceptualised to add a little style to the room. The classic dining room does not disappoint. In the centre, we have a marvellous marble dining tale, with elegant dining chairs upholstered in a rich fabric. A hanging chandelier in the centre compliments the wooden ceiling design. The small temple in the house has been given its own corner, so as to allow anyone in the house to spend time here. 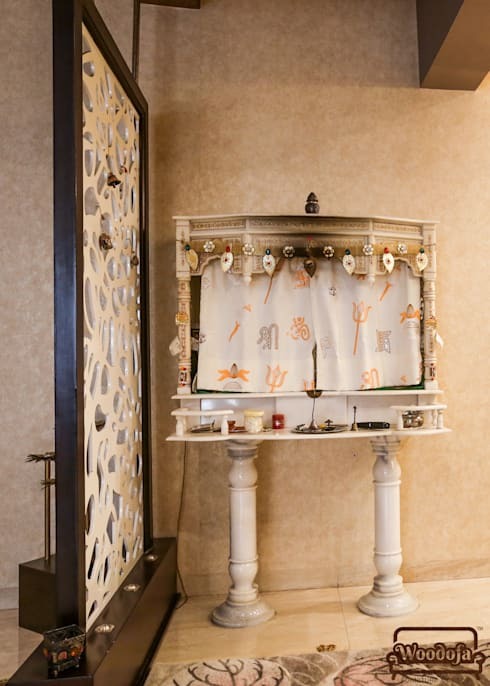 This beautiful, carved temple also has a small laser cut wooden panel beside it, which separates it from the living room. The chandelier we just saw in the dining room is more clearly visible here. Instead of crystal drops, this chandelier has beautiful crystal rings that light up the area. 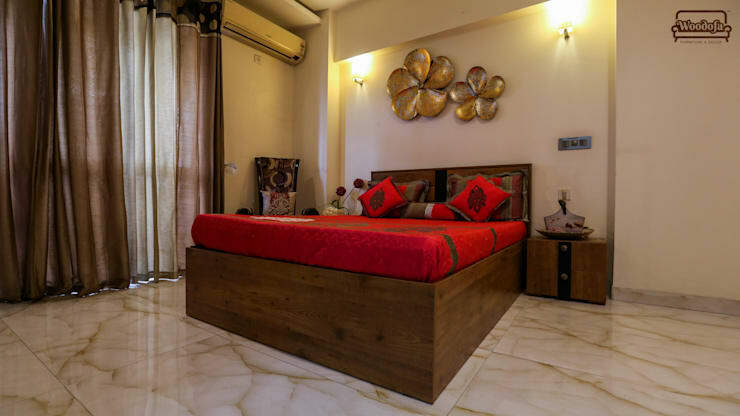 The magnificent bedroom has marble finish tiles, with a polished wooden bed frame and some elegant metal floral décor on the walls to complement the otherwise simple décor of the room. This family lounge area has a ton of space for relaxing or even working out occasionally. It has been kept bare in order to provide the space to host guests. This bedroom wowed us at first glance. 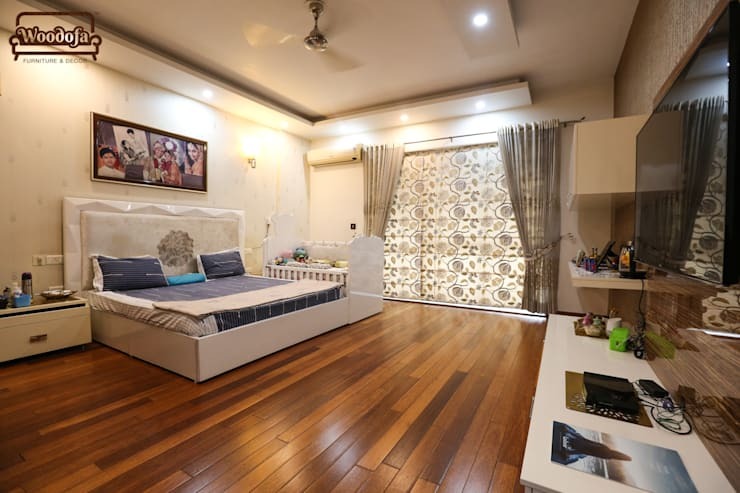 It has spectacular wooden flooring, which is our favourite. 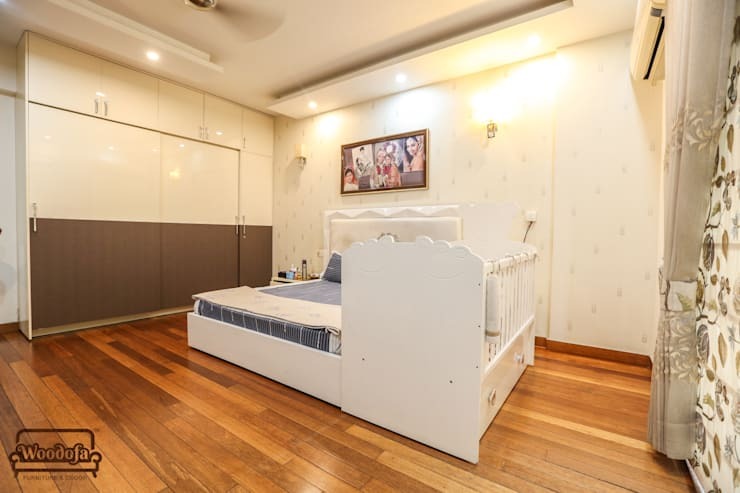 The bedframe is white and the baby crib matches the design and colour of the bed. There are large windows on one side of the room, with a double set of curtains. Here, we can see the wardrobe with its designer colour scheme. The sliding doors make it easy to operate, even with the baby around in the room. The room has been kept elegant otherwise with the all white colour scheme. 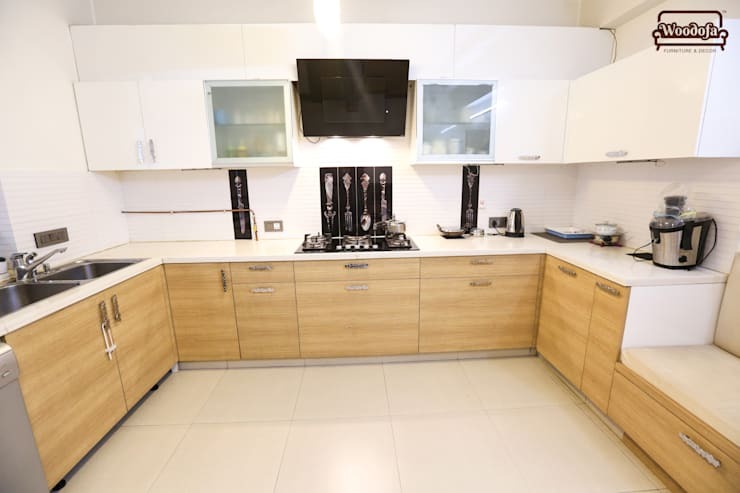 We end the tour with this elegant kitchen, equipped with all modern appliances. The wooden laminate used in the drawers compliment the white laminate in the wall-mounted drawers. The backsplash is white, which is a bold choice but not unheard of in modern homes. 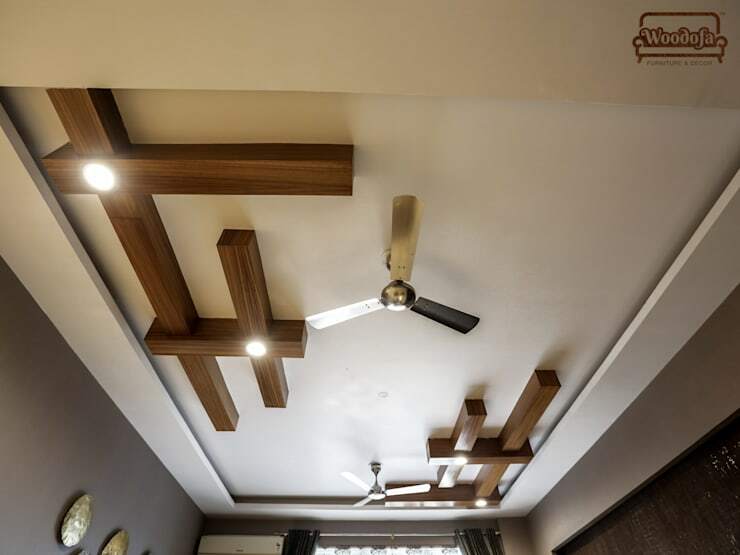 To check out some amazing ideas, click on the link here – Industrial style decor by interior designers and decorators in Hyderabad.